Christchurch is Awesome video series. 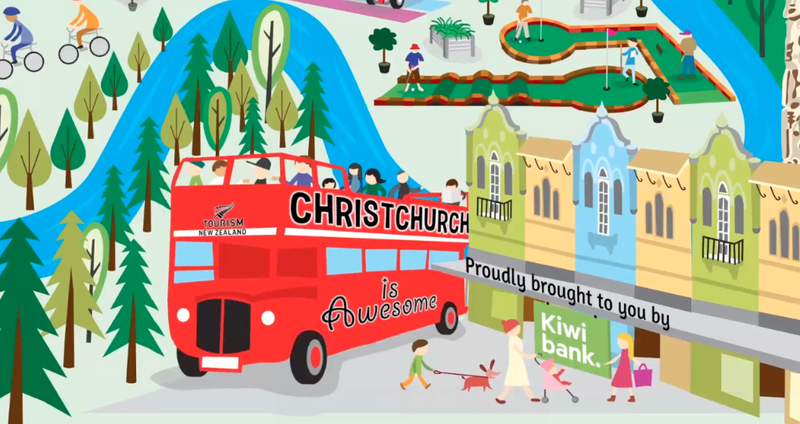 Over the last four months my team and I have created a massive koha (gift) for the tourism industry and people of Christchurch, in the form of six videos highlighting the new colours of the post earthquake city. It all started when I first visited Christchurch in May of this year. It was the first time I had visited the city since the February earthquake. I had only heard stories of a broken city via media and the rumor mill had built a negative image of the city in my head. It only took a day of walking around for my emotions to switch from sadness to happiness and positivity. The city is alive and the people running the place are incredibly passionate and positive about life and their city. Lonely planet rated Christchurch as one of the top ten cities in the world to visit in 2013. To be honest I thought this was out of sympathy, but it’s not until you’re in the heart of the city that you really understand this. There is creativity in everything being developed; from a downtown area built out of brightly painted shipping containers, to quirky gardens filling vacant sites, a volunteer built mini golf course using road cones in the CBD, and a whole venue built using pallets. I was so moved with how positive this new city is, I wanted to show all my friends and family that Christchurch is awesome and the rumours are rubbish! It’s not until you’re here that you understand this, so how could I make this happen? This project started as a plan over a coffee at C1 Cafe with now good friend Kimberley from the Ministry of Awesome. Kimberley helped connect me with the right people and assisted with the hardest job, securing financial support. KiwiBank and Tourism NZ stepped up to this challenge and without whom this project would not have been able to go ahead. Bare Kiwi had never undertaken such a massive task before and would not have been a success without good mates Sam Kennedy from Capture NZ and Ben Sarten. I would also need to beg, borrow and beg some more to create these six videos to help promote “CHRISTCHURCH IS AWESOME” to the world! I haven’t made a profit off this whole project, that was the plan from the beginning. It is a gift. This project is all about Christchurch, bringing people back to visit this city. I am confident these videos will do just that. I believe in Christchurch and I urge you to visit and experience it for yourself. So make a coffee or grab a beer sit back and I hope you enjoy these videos and pretty please can you share them for the people of Christchurch.